This Feiss Merrill 1 light small hanging outdoor porch lantern in heritage bronze finish is rated IP23 and features Art Deco style and etched glass. Boasting ceiling mount, chain suspension and circular chain lantern, with top eye, brimmed roof and outer rods jointing the two halves. The bottom features curved buttresses attached to a lower rod and finial and the lantern is fitted with etched cream glass for a wonderful glow. Exterior fittings must have an IP (Ingress Protection) rating which indicates the fittings ability to prevent solids and liquids penetrating the enclosure. The higher the number, the greater the protection. The minimum rating for an outside light exposed to the weather is IP23. This fitting is rated IP23. This exterior light is supplied by Elstead Lighting and designed in the USA by Hinkley, founded in 1922 in Cleveland, Ohio. 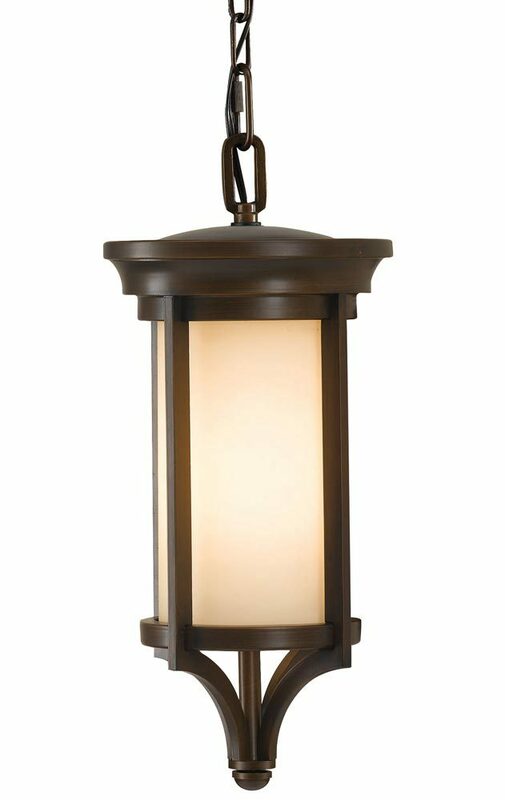 They have transformed from a small outdoor lantern company to a global brand intent on bringing you the best in style, quality and value designs like the Merrill 1 light small hanging outdoor porch lantern in heritage bronze finish and rated IP23 featured here.